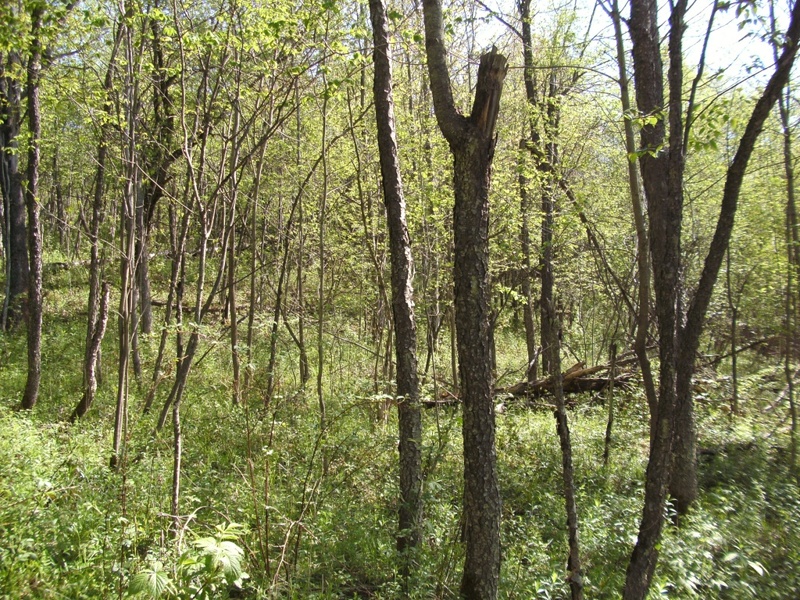 The goal of this research is to test the environmental and economic impacts of converting a northern hardwoods stand into a silvopasture when compared to treating the stand as a managed forest or converting it to an open pasture. Additionally this project addresses the establishment and productivity of six forage treatments and their influence on soil properties within the silvopastures and recently cleared open pastures. 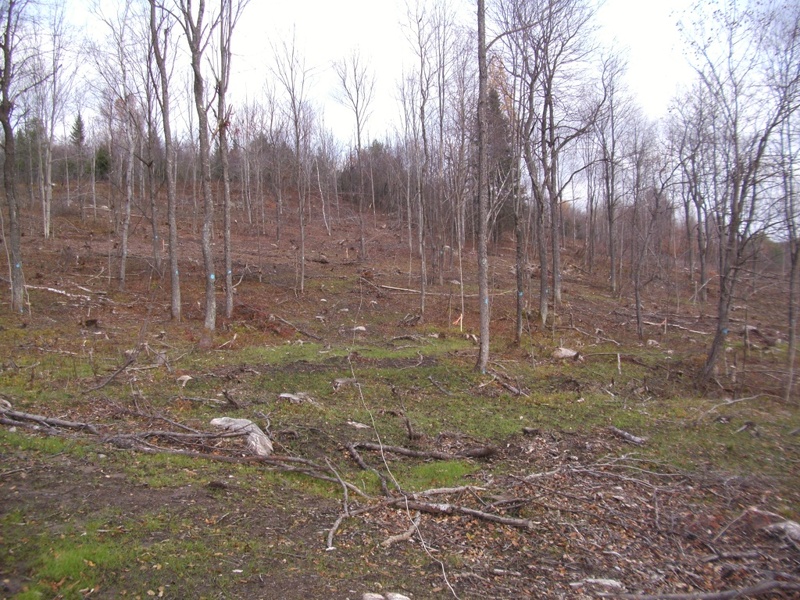 During the summer of 2012 nine main plots were harvested from an existing stand of northern hardwoods. Prior to harvesting, understory and overstory vegetation was sampled, as well as soil properties and photosynthetically active radiation. Crop trees were painted in the woodlot and silvopasture plots to a target basal area of 40 square feet per acre, prior to harvesting the site had on average 100 square feet of basal area per acre. Harvesting occurred in July and whole trees were removed and chipped for biomass fuel. A class of nine forestry students from Paul Smith’s College visited the site during this time to see the operation in progress and speak with the logging contractors. On August 15th and 16th six main plots (the silvopastures and open pastures) were planted with the six forage establishment treatments: none, loose hay depositing, orchardgrass-white clover, perennial ryegrass-white clover, Kentucky bluegrass-white clover, and smooth bromegrass-white clover. Cattle were then used to trample in seeds. Due to dry conditions in August, germination of grass and clover seeds did not occur until mid-September. In October forage seedlings were sampled in the silvopasture and open plots to determine germination success. In November, 21 forestry students from Paul Smith’s College volunteered to assist in tallying residual stand damage and epicormic branching on the site. Remaining tasks are to sample forage productivity in 2013 and 2014. Preliminary results of this work will be presented at the Vermont Society of American Foresters meeting on March 8, 2013. I have also been discussing hosting a farm tour in 2013 with Cornell Cooperative Extension, although this may be better accomplished in 2014. In 2014 soil samples, epicormic branching, and understory vegetation will all be re-sampled. I will also be offering presentations of the results of this project at conferences that year. Results of preliminary measurements and germination success have not yet been analyzed. A preliminary analysis of forage germination indicates that orchard grass and perennial ryegrass may be the most successful. It also indicates that nearly no forages germinated in the hay and none treatments, although both of these may see changes during a spring green-up as these seeds may need cold stratification. A major change to the economic costs of this project was related to the harvesting of timber. The original plan was for me to harvest timber using a farm tractor and skidding winch. Due to mechanical issues followed by time constraints the project’s budget was adjusted to hire a logging contractor. This may have been an inherent problem in attempting to use farm equipment to effectively harvest considerable amounts of timber. The cost of harvesting the site was $444 per acre plus the wood removed from the site. The harvest was a cost to the project (as opposed to an income source) due to low wood biomass prices and the small area to be harvested (6.75 acres). As results of this project are still very preliminary, they have not generated new ideas or a change in the tract about silvopasture establishment. One thing that was easily witnessed however was the heterogeneity of site disturbance in the silvopasture and woodlot plots compared to the open plots. The open plots had far more uniformity in mineral soil exposure, while the silvopastures and woodlot plots only had mineral soil exposed on skid trails, the understory was intact where logging avoided residual trees. The year 2012 did not see many changes to North Branch Farm. I have begun to experiment with crossing Scottish highland cattle with Angus and Herefords. I have also expanded my establishment of silvopastures to thinning out and pruning overgrown volunteer apples in former pastures. While not part of the research in this SARE grant, these silvopastures provide an additional example of the practice on the farm. Richard Smith, technical advisor to this grant, has been active in providing advice and some lab equipment to this project. Other faculty at the University of New Hampshire have also reviewed the status of this project. Dan Kelting, a professor at Paul Smith’s College and soil scientist, has been active in assisting with soil sampling. As mentioned earlier, forestry students at Paul Smith’s College have graciously volunteered their time to assist with tree measurements on the site.